A girl, believed to be two or three years old, has been abandoned in a pushchair in a Kent library. Staff at the Folkestone library in Grace Hill discovered the child while they were closing the building at about 18:00 GMT. Kent Police are looking for a woman, who is described as white with fine, dark, medium length brown hair. She was caught on CCTV and was wearing blue jeans when she left the blonde-haired child. The girl is well and being cared for by social services, said a Kent Police spokeswoman. Anyone with any information has been asked to contact Kent Police. 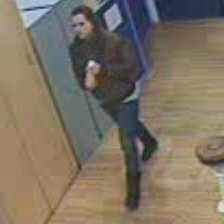 The woman Kent Police were urgently trying to trace after a young girl, aged approximately two to three years old, with blonde hair, was left in a pushchair at a Folkestone Library, has been found safe and well. She is currently being questioned by officers. Kent Police was called at just after 6pm this evening by staff at the library who discovered the child whilst closing the library.